Easy to set up with some useful bonus features, but speeds are unexceptional. 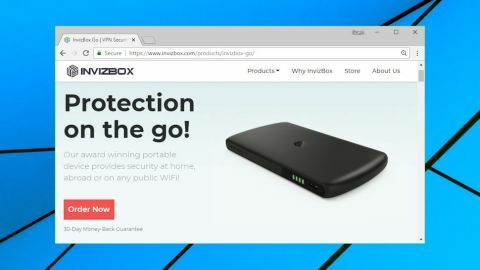 InvizBox Go is a lightweight portable VPN router which allows you to secure all your devices, wherever you are, and whatever dubious public wifi hotspots you might have to use. The unit creates its own hotspot, making it very easy to use. Connect your devices to the InvizBox Go network, connect the InvizBox Go to your target network, and all your internet activities are immediately protected by an industry-strength IPVanish-powered VPN. The browser-based interface allows you to choose from 19 countries and hundreds of servers. Built-in Tor support gives you another welcome privacy option, or you can turn both modes off and use InvizBox as a simple wireless extender. At 125 x 70mm, the InvizBox is around the size of a mobile phone. It's a little thicker, at 12.5mm, which lifts its weight to 300g, but that's still lighter than competitors such as BetterSpot and Keezel. The InvizBox is powered via a USB cable. The developer claims its 5000 mAh will give you ten hours of battery life, which may be a limitation, but as a bonus, a USB output port means the unit can double as a portable power bank for charging other devices. Prices start at $99 (£75) for an InvizBox plus two months VPN subscription. Opting for the $139 (£105) Silver plan gets you a 12-month subscription, while the $179 (£135) Gold plan covers you for two years, and all purchases are protected by a 30-day money-back guarantee. InvizBox is good value for a VPN router, but it's worth considering the alternatives. Using a stand-alone VPN requires more work, as you must download, install and learn the various clients. It's also not as good at isolating your internet connection. You'll get more features and a more responsive interface, though, and it can be much cheaper. A NordVPN account supports up to 6 simultaneous connections, and has apps for desktop and mobile devices, but can cost as little as $79 (£60) for two years. Our InvizBox Go arrived safely packed in a compact cardboard box, along with a zip-up protective case, a micro-USB cable, a couple of tiny 'Getting Started' sheets, and an InvizBox card with our wifi password. There's no obvious On/ Off button on the InvizBox case, but that's because it's neatly concealed under the tiny logo. Press and hold for a couple of seconds, and a few moments later a wifi LED lights up to show its network status, which initially is red to indicate there's a little setup work required. Once it's powered up, InvizBox creates a wifi hotspot called InvizBoxGo. Connect to this on any device, point your browser at inviz.box, and it automatically prompts you for the main wireless network you'd like to use, and its password. That's enough to get InvizBox working as, effectively, a VPN router. The InvizBox creates an OpenVPN-based VPN tunnel to your nearest server, and when you connect other devices to the InvizBoxGo network, their traffic is redirected through the tunnel to your destination. There's no login or software required on any of your devices, everything is handled automatically by InvizBox and its VPN connection. Although the default InvizBox settings work just fine when you're getting started, logging back into the InvizBox administration interface reveals some other options and features you'll want to explore. These start with a choice of VPN locations. InvizBox offers 19 countries across Europe and North America, with Australia, Brazil, Korea and New Zealand thrown into the mix. Pick a location, optionally choose a server (there are more than 100 servers available in the US, alone) and InvizBox automatically makes the connection. Although this worked well for us, keep in mind that this kind of browser-based interface can't match the usability of a native VPN client. To choose a new location in ExpressVPN, for instance, you can click the Choose button and pick a country from the list. Takes three or four seconds. To do the same with InvizBox we had to click Choose, wait around ten seconds; click to view the drop-down list of countries, click again to select; click Save, wait another ten seconds; click Return to get back to the status window. InvizBox doesn't have any supporting VPN features, either. There's no indication of server load, for instance, and no favorites system to more easily return to an important server. If you discover that the server 'New York - nyc-ac24' enables connecting to Netflix, for instance, while 'New York - nyc-ac25' doesn't, InvizBox gives you no way to save or record that information. You'll have to note it somewhere else. These problems aren't specific to InvizBox, they're typically what you'll see with hardware routers. But if you regularly need to change locations, they're worth keeping in mind. InvizBox does have some notable extras, including optional Tor support. If the VPN doesn't do what you need, you're able to switch to Tor from the admin window, and anything which connects to the InvizBoxGo network will use Tor by default. A third option enables using the InvizBox as a wireless extender, without the extra privacy or security layers. You probably won't use that very often, but it's good to have the flexibility. A bonus Adblock feature blocks ads from some of the most common sources. We suspect this won't match your regular ad blocker, and the fact that it's turned off by default suggests it doesn't do a lot, but it's here if you want to try it. There's plenty of status and troubleshooting information to help you figure out what's going on: local and external IP addresses, gateway, connected devices, active network connections, real-time graphs of network traffic and some very detailed logs. VPN tweaks are a little disappointing - there aren't any beyond the choice of location, not even protocol - but there are a lot of others. If you want to set a custom NTP server for the device, add a HOSTS file or configure DNS forwarding rules, it's all available here. Overall, the InvizBox admin console doesn't score well for VPN features or usability, but it covers the basics, Tor support is a plus, and experts will appreciate the wide range of network and other technical settings and options.